Hello everyone and welcome to another weekly recap. I really hope your week was better than mine, in real life at least. On Stardoll, I couldn't complain. (Well, except my Royalty membership ran out, but oh, well.) Anyway, I hope you are ready for another weekly recap, to check out the biggest moments that marked last week on your favorite online game. Here it goes. Christmas is about a month away, but still, Stardoll has decided to start releasing holiday themed stuff - this week, we got holiday collection in Kitch interior store. The collection is themed with mostly winter stuff, we have some nice decorations and items. I love that Stardoll started releasing holiday stuff earlier, giving users chance to save up stardollars, buy stuff and have their holiday rooms ready for Christmas. I won't be doing that, as I am not fan of decorating my suite, especially not for such temporary occasions, but I love seeing all the amazing rooms you come up with. On Tuesday, Stardoll launched a Thanksgiving campaign. They released a set of Academy tasks to be done on different days, but me and some other users got them all in day one. The tasks were pretty simple and you did not have to spend much to complete them, and as a reward, you'd get nice, Thanksgiving themed stuff, like a wreath, or a pumpkin pie. There was also a scenery contests, where upon completing it, you'd get a cute puppy. 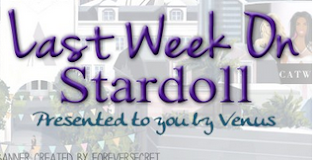 I like that Stardoll cares about all their members, and the gifts were pretty cute for decorating. Again, not for me, but I bet you can use the gifts well. The same day (or a day before, I am not sure), Stardoll gave paying members an option to extend their membership and get 3 free gifts. Pic from USD, sorry, forgot to take my own. Gifts are nice, but still not nice enough to make me do extend my membership. But it is a great incentive for ones who renew it often. I don't know how long this offer will be available, but again, if you were planning on renewing your membership, now is a great chance. That dress is elegant, and that jacket can spice up any 'ordinary' outfit. On Wednesday, Stardoll released a new floor of Millionaire Mansion Fashion store. I sort of like the collection, it has nice items, perfect for this season. I love the trench coats, and we got some nice blazers as well. Some dresses too. Overall, an okay collection, with few pieces that can be used really well. Th outfits are, of course, elegant, sophisticated, (well, some of them at least), we got a variety of patterns, fabric and colors, we got even a nice suit for male users. (Or female, who like to dress their pals.) Like I said, some are more sophisticated, and others are rather couture. And there are nice accessories, as usual. And the same day, we (finally) got a 50% off sale in Starplaza! I know you've been waiting for this sale for a really long time. I wasn't really looking forward to it, and had no plans on spending much, but I did end up spending much more than I planned. I regret some of my choices, but at least that will keep me from buying more new stuff. (Oh, who I am I kidding?) Anyway, 50% off was a nice chance to get some stuff that's been on your wishlist for ages, and maybe check out stores in case there is something you need to have in your closet and will wear often. Or at least once. Anyway, almost all stores had a sale, but there was a hint. On Friday, you got 50% off, but in case you wanted to wait for the following day to buy, the discount was 40%, and finally, today, 'only' 30%. Nice idea, making us rush into buying stuff on the first day without much thinking. Still, I am glad we got this sale, and I am happy I still have some stardollars left. But seriously, who can resist a good sale? And that's all for a week. Phew.. I hope you liked it, so vote on the poll, leave a comment, and see you next Sunday.